How do we explore the places we travel to? For some travellers, the must-see touristic attractions are at the top of the list, others prefer to look for the hidden gems and some of us prefer to improvise. If we already have visited the destination, we might spend more time researching what to do out off the beaten track. But there is something that is always compelling: the opportunity to experience a place as locals do. That is what our client in this concept project wants to offer. 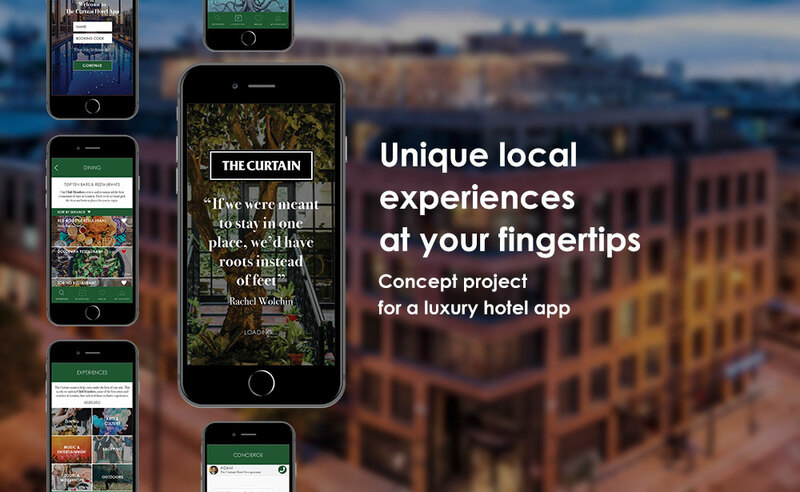 The brief assigned to our group is related to The Curtain Hotel, a five-star hotel and members’ club located in Shoreditch that offers several exclusive areas, providing a central new hub for creative professionals. This luxury hotel wants to pilot a new program that will hotel allow recreational and business travellers to plan and book local experiences, making it easier for get to know a place through the eyes of those that live locally. Our job is to design a native app to offer the service. This is a concept project, part of the User Experience Design Immersive course I attended at General Assembly London. This is a group project: I had the pleasure to work with Nicola Young and Luna Felo for this two weeks sprint. The first step is to gather all the information to understand the challenge and obtain valuable insights. Synthesizing the research findings to specify the right problem to focus on and solve. Open up phase to explore different possibilities to solve the problem we are focusing on and evaluate what might be the best solution. 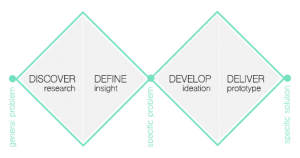 Build, test and iterate on the chosen solution to make sure it solves the problem. Do other five-star hotels in London offer a service similar to the one we want to create? How are they doing it? Are there other non-direct competitors we should take into account? We researched several hotels in London as well as other companies that offer activities and experiences out of the beaten track, such as SideStory and Airbnb Experiences. From the contextual inquiry we learnt that our target audience is older than we initially assumed, the guests are looking for a relaxed and sophisticated atmosphere and mix business and pleasure. There were no recommendations for any kind of activities outside of the hotel on offer. We interviewed 10 people, both business and leisure travellers. We wanted to know about how they plan their trips, what do they actually end up doing and why do they choose whatever activities they book. Once the reflection on our interview insights is done, we are ready to create our persona. Personas are archetypical users whose characteristics represent a larger group of users, they are really helpful to focus on who are you designing for and empathise. Luxury travellers need a way to have memorable experiences from a verified, trusted source because they don’t want to spend a lot of time planning to then be disappointed. How might we offer unique suggestions on where to visit from locals? How might we make it easier for users to find local experiences? We believe that by offering memorable experiences from a verified, trusted source to luxury travellers we will achieve successful travel experiences that require little time to plan. The goal of this project is to design a Minimum Viable Product with enough features to satisfy the brief as well as the main user needs. We conducted the feature prioritisation in order to specify the actions users would be able to perform and start sketching the user flows. Time to start thinking on solutions for our core problem. 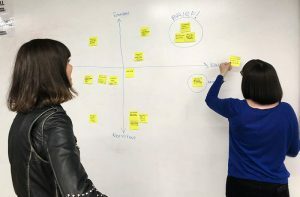 We ran a design studio to start the ideation stage using the crazy 8’s sprint method: a fast sketching exercise that challenges people to draw 8 different ideas in 8 minutes to solve the problem we are facing. The goal is to push yourself beyond the first solution you think about and unleash your creative impulses. 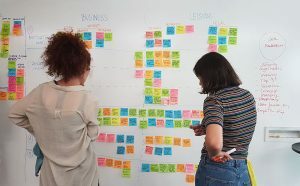 Based on the feature prioritisation, we created the flows for the tasks the user would be able to perform and started the first round of paper prototypes. The screens show how Ella would go through the process of browsing and booking a restaurant and speaking to the concierge. 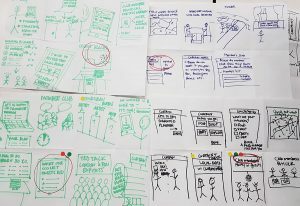 We created our first digital prototypes to test with the iterations from our paper prototype and did three rounds of testing. 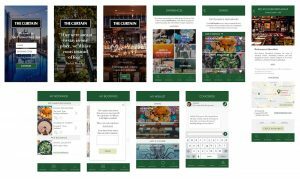 We created a brief style guide for the app, based on the client’s website look and feel, to produce the final mockups for the app.